← I’m Not Finished Yet! ‘Water, water, everywhere and not a drop to drink’. Being the sensitive little soul that I am, I was most annoyed to feel that tell tale tightness of my skin and was more than irritated to conclude that yet another product was provoking a not-in-a-good-way reaction to my pate. Time for a new moisturiser. I’ve been aware of Apivita for some time now, the Greek skincare line that cares about the environment and is gentle on your pocket. 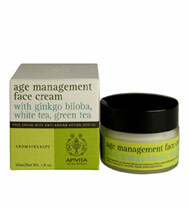 So I decided to plump for the ahem, Age Management Face Cream with Green Tea. Packaged in the real paper feeling colourful box, the overall packaging says ‘we don’t need to show off, the proof is in the glass pot with the no fiddly easy grasp top that twists off to a grainy sound that makes you think there’s something special inside’. And indeed, there is something special inside! This moisturiser has a really rich but firm texture that feels as light as a feather on skin with that extra velvety touch thrown in for good measure. This line is part of the Aromatherapy range which uses the power of nature, essential oils and plant extracts in a base of green tea. Green tea, we’re told does a multitude of good things for us, being a powerful anti-oxidant is one that I especially like. Green tea water instead of plain water means extra toning and moisturising. Also formulated with gingko biloba and white tea that offer the same kind of powerful protection from those nasty free radicals responsible for premature aging and this is sounding like a moisturiser that’ll work hard to keep me looking great! Essential oils of orange and lemon to give my skin a youthful appearance and an SPF of 15 is like a bonus all wrapped up with a Fair Trade bow! So far, so good, I really like this moisturiser. I’m very impressed with the hydration to my poor smoker’s skin. Priced at €28 from a range of chemists across the country, you know that your money isn’t paying some for some over hyped Slebs advertising contract. Next on my list is this dreamy night cream. For a full list of stockists, these girls are on the button and this website delivers free of charge but it disappointedly doesn’t have the full range of Apivita products. This entry was posted in Beauty Me Full and tagged Beauty, Skincare. Bookmark the permalink.